Famed toy train maker Lionel first offered model trains in the 1/87th HO-scale in the late 1950s. The initial Lionel-HO line was withdrawn by the mid 1960s. In 1974, Lionel-HO returned in a big way with a number releases that still find themselves in other company's product lines in the 21st century. The second line of the 1970s is the focus of this Lionel-HO 1970s Catalog Resource. 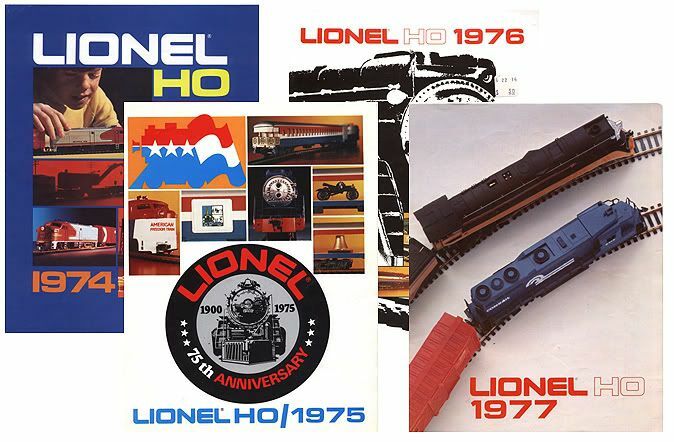 Here you'll find viewable website reproductions of Lionel-HO's 1974-1977 catalogs. Though Lionel did again offer some HO-scale releases following those you'll view in the 1977 catalog, this was the final time to date that the company attempted a full range 1/87th line.